In August 2018, Hurricane Florence came on shore in North Carolina. Much of the damage was from flooding because the storm moved slowly over North and South Carolina. Parts of North Carolina had over 30 inches of rain from the storm, and this caused many of North Carolina’s rivers to overflow their banks because the water just does not have any place to go. 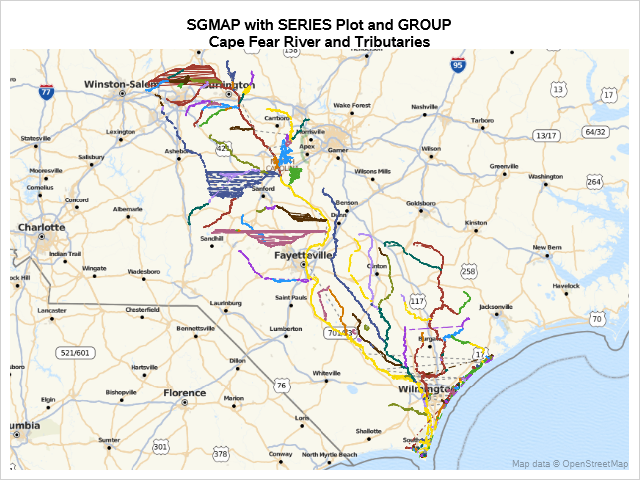 In this example, North Carolina GeoSpatial data for the major river basins is downloaded and used in PROC SGMAP as SERIES statements. The path of the storm is also plotted so you can see why the Cape Fear River Basin had major flooding. 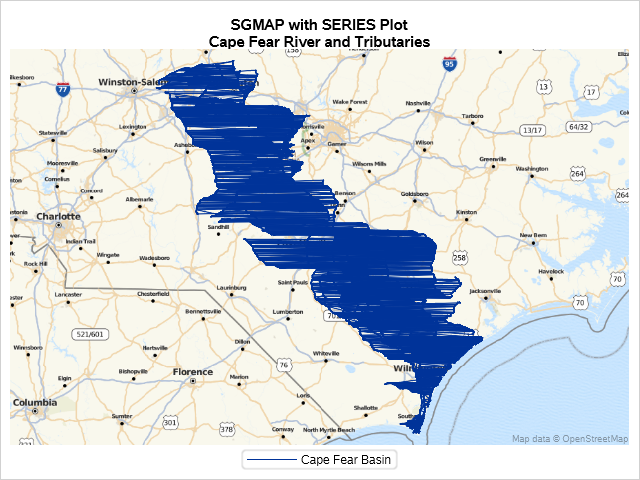 Download data from NC OneMap North Carolina GeoSpatial Portal, and search for “Major Hydrography” and download this shapefile. OpenStreetMaps and Esri Maps require WGS 84 coordinates. Use PROC GPROJECT to change coordinates. Here is an example of how this procedure looks. id objectid is used because many shapefiles use this variable to organize data. This is an indication of the parameters used for the GProject from= option. Use this string for from= in GPROJECT. The to= setting is always EPSG:4326 for OpenStreetMap and Esri maps. Now that you have the river basin data imported and in the correct coordinates, use the PROC SGMAP SERIES statement to plot the river basin. That is better, but some of the rivers and streams still wrap. The PROC SGMAP SERIES statement breaks lines when there is a missing Y variable value. The missing values are needed when plotting several series lines. That looks good. The different tributaries for the Cape Fear River are now clear. 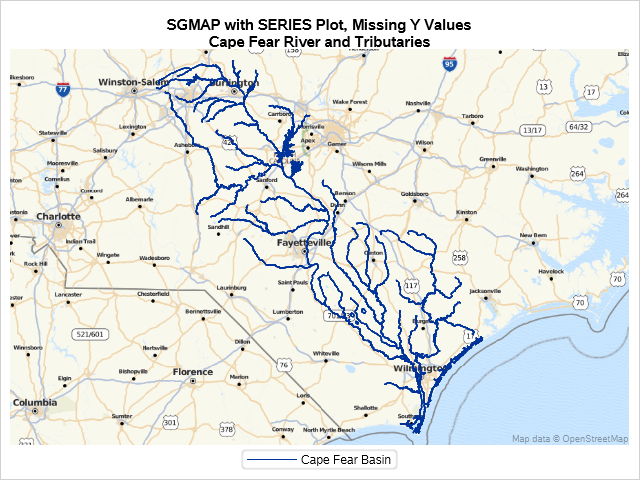 Why was this river and all its tributaries a problem after Hurricane Florence? Try plotting the storm's path and strength to find out. There are several websites that contain hurricane tracking information. 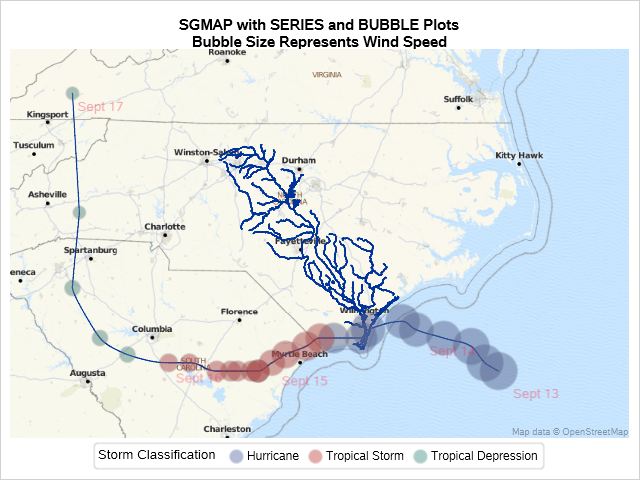 Combine the river basin data with the hurricane track data and plot using SERIES and BUBBLE statements in PROC SGMAP. On the East Coast, much of the rainfall from a hurricane occurs on the north side of the storm, so you can see why the path of Hurricane Florence causes flooding in the Cape Fear River Basin. There was just too much water. From this example, you can see that PROC SGMAP is an easy way to plot data from shapefiles and CSV files on Esri maps and OpenStreetMaps. My upcoming blog will be using PROC SGMAP with PROC GINSIDE and GEODIST.